Dark Chocolate Peanut Butter Explosion! I recently walked into my apartment building, arms filled with groceries, when the doorman stopped me to let me know that I had a package at the front desk. Uch, not this again – another package that doesn’t belong to me. You see, last week we received two mysterious packages that were not for us. One was small and had The Husband’s name on it, so we opened it. Turns out it was for The Brother-In-Law. Womp Womp. The second one was rather large and looked quite appealing from the outside… but again, not for us. Grr. (If this handsome looking package belongs to you, let me know, and you should come and claim it ASAP!). Guess what? It was! (Insert victory music here!) You all know how much I love sweets. I think I’ve made that very clear. But, as much as I love sweets and treats, I also love presents. Just ask The Husband, he’ll tell you! Well, I picked up this amazing surprise present at the front desk, and you know what it was? The Serendipity Sundaes book, which features tons of amazing ice cream constructions and frozen concoctions. Honestly, it’s the best. I opened the book to find a cute little note from my dear friend which read I saw this and thought of you. Hope it helps provide a little inspiration for 365scoops. You can bet your little bippy that this book provided me with some great inspiration. This recipe is a testament to how awesome this book is, but more importantly, a testament to how super duper awesome my friend is. I’m the luckiest girl in the world! Look at that beautiful chocolate. Yes. 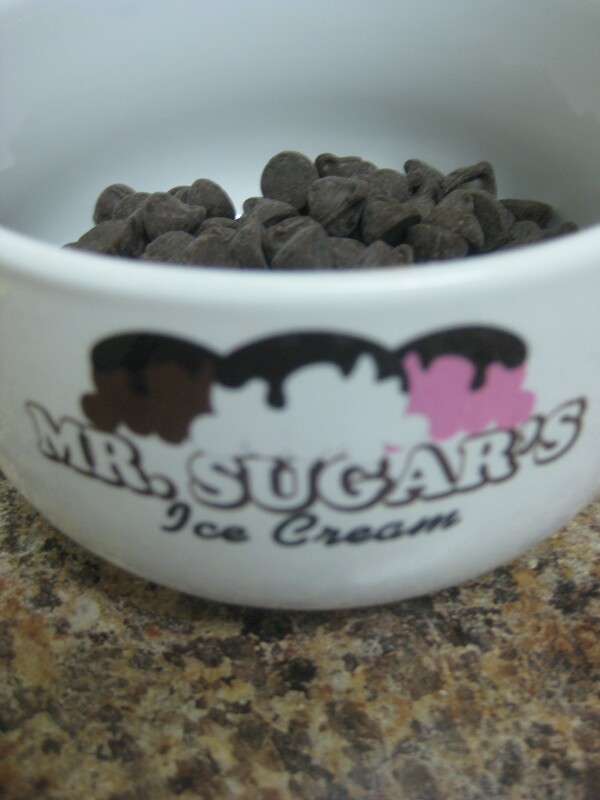 I melted the chocolate in a personalized ice cream bowl. Why not? An awesome gift from my girlfriends. First make the chocolate peanut butter chips. Place the chocolate chips in a microwave-safe container and melt on high for 30 seconds, remove, stir, and repeat until the chips are completely melted. This should take 1 minute – 1.5 minutes depending on the strength of your microwave. 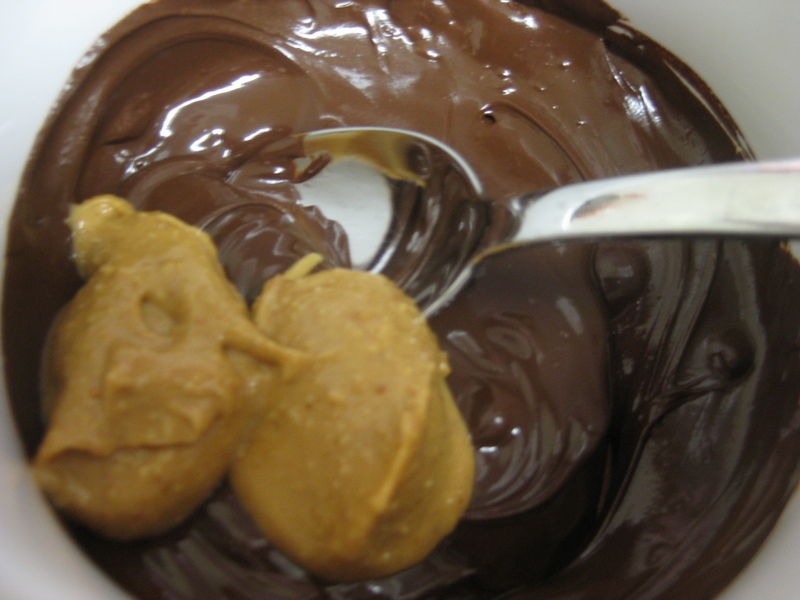 Stir in the peanut butter. Place a piece of wax paper on a cookie sheet. 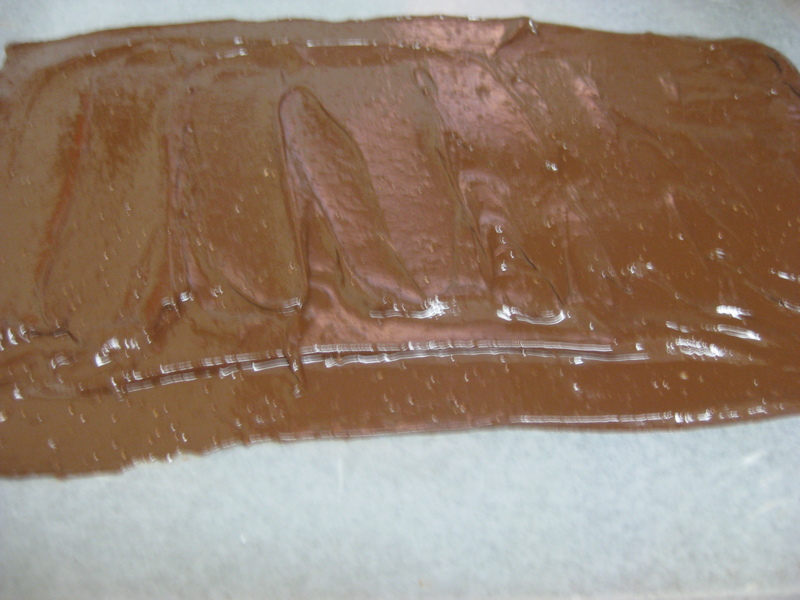 With a spatula, spread the melted chocolate peanut butter to the size of a 9×12 inch rectangle. 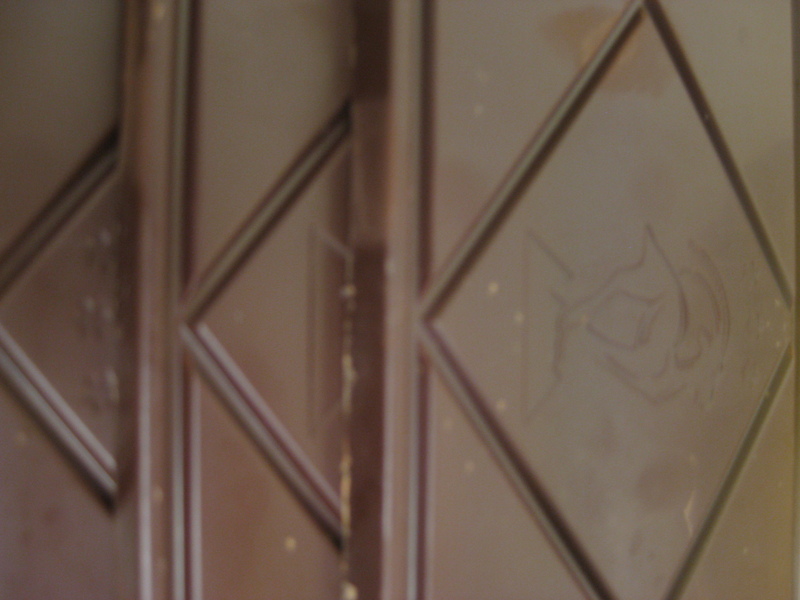 Place the tray into a refrigerator until the chocolate hardens. When the mixture is firm, break into chunks and refrigerate until you are ready to use. Now it’s time to make the ice cream base. Combine milk and cream in a large heavy-bottomed saucepan and heat until warm over low heat. 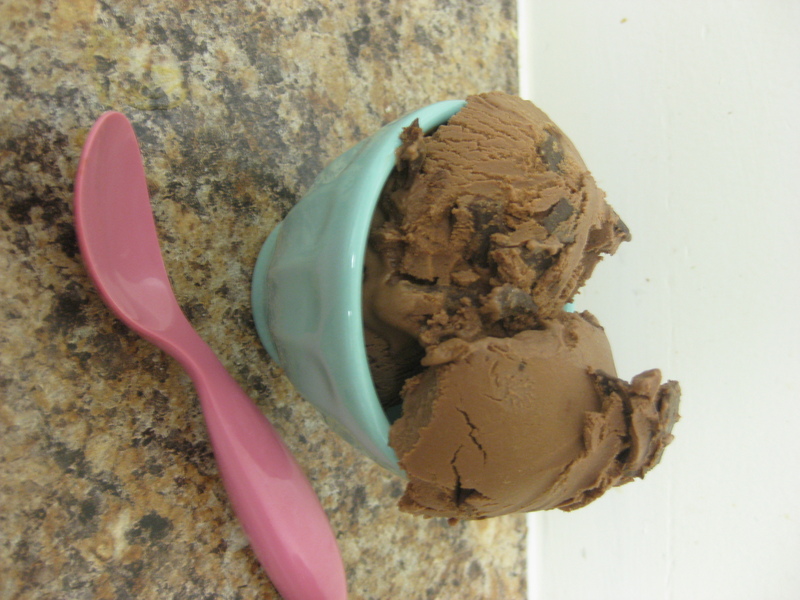 When the milk mixture is warm, add the chopped chocolate. 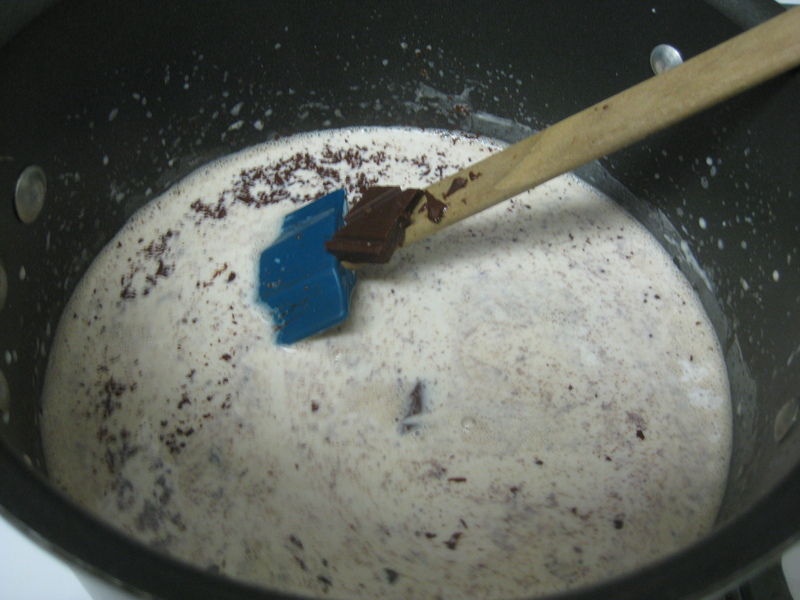 Heat, stirring constantly until the chocolate is completely melted and the mixture is beginning to simmer. Set aside. 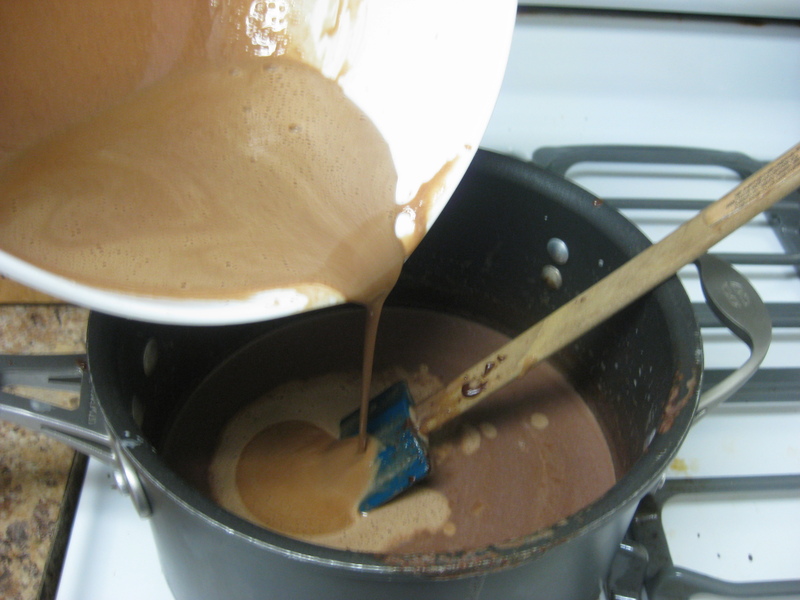 Add one-fourth of the warm chocolate mix to the yolk mixture and whisk until blended. Whisk the egg yolk mixture into the remaining milk mixture and cook over low heat, stirring constantly until the mixture reaches 170 degrees F. Remove the mixture from the heat and pour the batter into a clean heat-safe bowl and cool to room temperature. Whisk the vanilla extract into the batter, cover, and refrigerate at least 2 hours or overnight. Remove from the refrigerator and pour out one cup of the prepared batter and whisk in 1/2 cup of peanut butter until smooth. Whisk this small mixture into remaining batter and freeze in an ice cream maker according to the manufacturer’s instructions. Approximately 5 minutes before the mixture is done churning, slowly pour in the peanut butter chocolate chips so that they mix thoroughly into the ice cream. 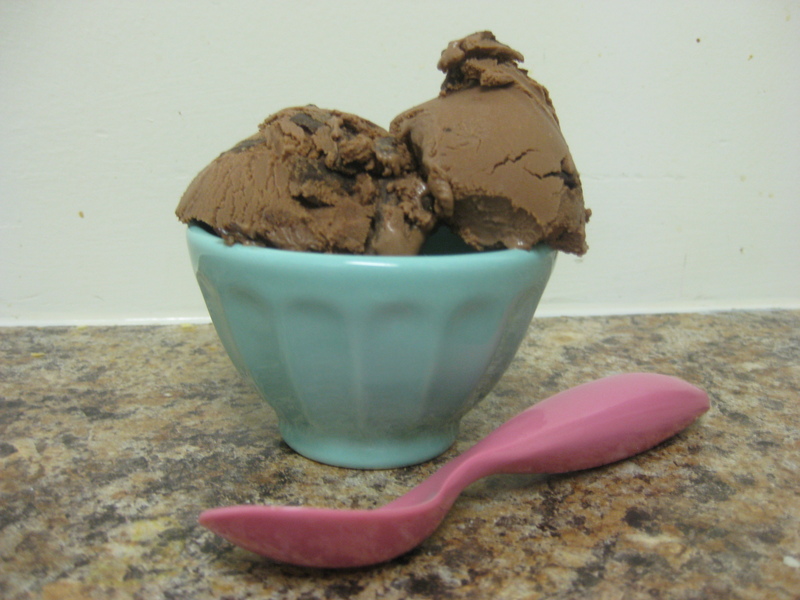 Scoop the mixture into a freezer-safe container and enjoy. Warning, you might eat this ice cream sttraight from the machine, it’s that good! Voila! Look at those chips. Dang that was good! The Verdict: Dark chocolate peanut butter explosion! Definitely an apropos name for this special treat. This ice cream was really rich, and really creamy. The bittersweet chocolate gave a slightly bitter flavor (duh) , but that was countered beautifully by the semi-sweet chocolate peanut butter chips. 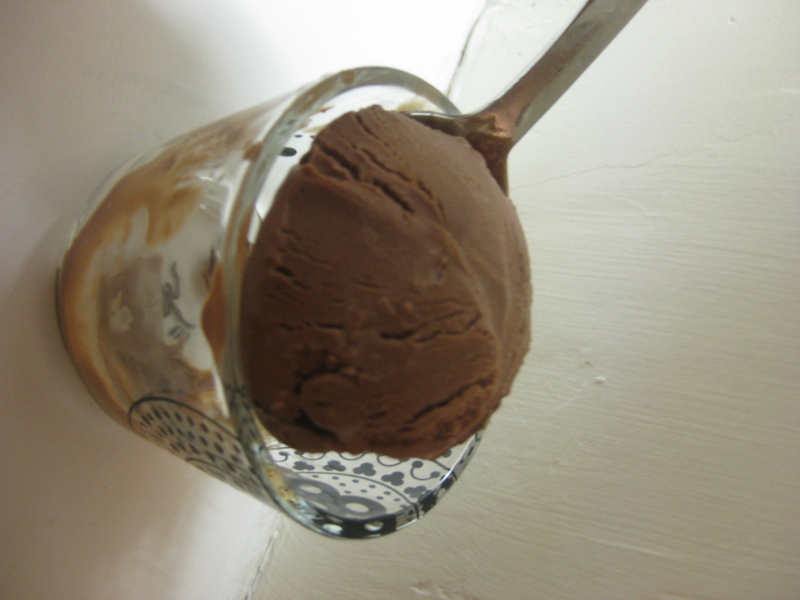 This ice cream hardened slightly more than usual so just leave it out for 5-10 minutes before scooping. It’s really yummy. Really, really yummy. It even made a guest appearance into an ice cream sandwich so stay tuned for more! WOOOT! That looks real good, Naomi. Really like the bowl, too. I love presents too, especially surprise ones! This looks divine…hope you are safe in NYC! Delicious! 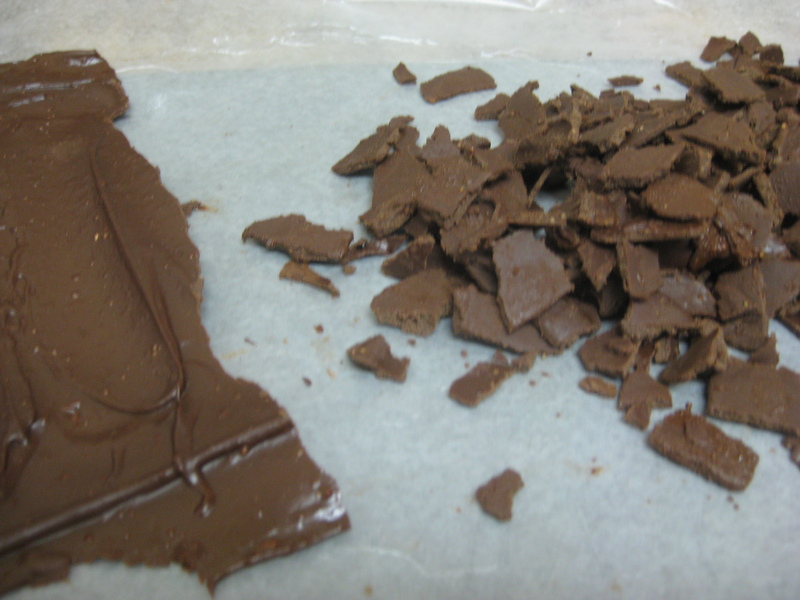 One adaptation that I did make was to salt the chocolate chips once I spread the chocolate on wax paper. YUM!